Collection Factory is a modern Joomla Extension that allows collectors to create and maintain a user-friendly database on the web of their collected items, organizing them in unlimited categories and subcategories. You can allow users to order and buy from your collection, or just present your collection as a web based catalog. You can access various statistical and financial reports, helping to keep evidence of owned items, but also keeping record of the missing ones. Collection Factory can be used as a full fledged Shopping Cart solution, with individual prices, catalog prices and multiple payment methods. Or you can disable the cart feature and use Collection Factory just as a searchable presentation Catalogue of your collection. Wether you collect Stamps, Books, Coins, Movies, Games or Old cars - Collection Factory is the best way to make your web presence a professional one. Collections Factory is the total software solution for your online collection projects, whether you're just starting or you've outgrown your current system. It also offers full support for Unicode, enabling you to provide access to collections in any language. 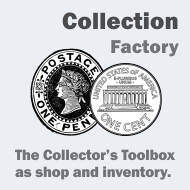 Collections Factory can also serve as your institutional repository. Paintings, coins, Stamps and any kind of collection can be exhibited and managed in our software.